Need Gear For Your New KTM 1190 Adventure? Dual Sport Warehouse Can Help! Pretty much the hottest new bike out there is the KTM 1190 Adventure and Adventure R and there are a lot of them hitting the trails and roads. The problem is that many of the “must have” accessories haven’t hit the shelves of most stores but Dual Sport Warehouse is already stocking up on 1190 Adventure accessories and has created a new tab on our site dedicated to featuring new gear that will fit the KTM 1190 Adventure. We are searching all our vendors to find the parts and pieces that fit the new 1190 Adventure and putting them all in one place so you can find them easily. 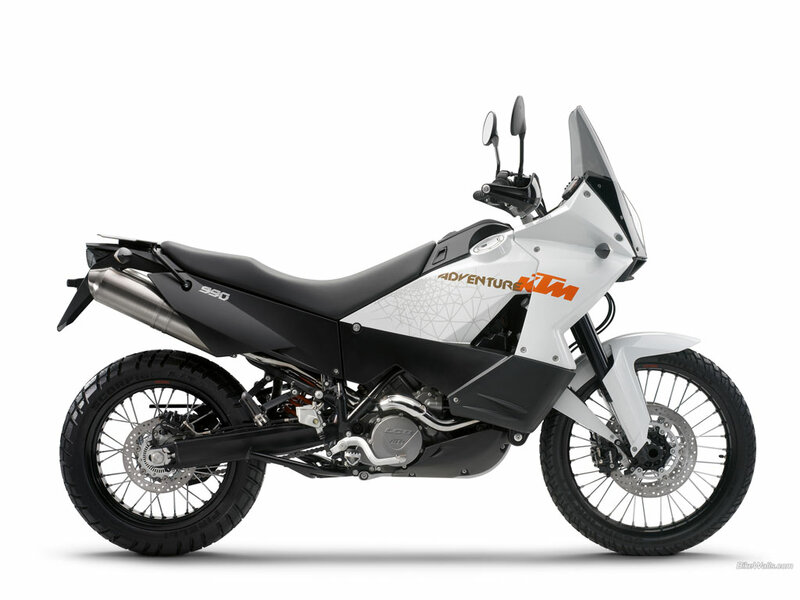 KTM 1190 Adventure R a great platform to customize and make it yours! Moose Racing – seats, crash bars, side-racks and the aluminum boxes to mount on the racks, etc. CJ Designs – footpeg extensions, sas plates, leather tool pouch, etc. And more stuff will be getting added on a regular basis so be sure to keep an eye on the website for all the fabulous new products! Be sure to check out the rest of the site as well since there are lots of useful items for many bikes listed in other areas of the site (like tires, brakes, bar risers, riding gear and much, much more). Dual Sport Warehouse has been using and selling Remus Sport Exhaust systems for years on KTM motorcycles and we have found them to be very durable and high quality. If you want a reasonably priced unit that will withstand years of use then you want Remus! Now Remus is one of the first to market with a beautifully crafted titanium slip on for the KTM 1190 Adventure, or you can choose the full carbon fiber model if you really want to stand out. This is the Slip On version of the Remus HexaCone which includes the connector pipe and Carbon Fiber heat shield. 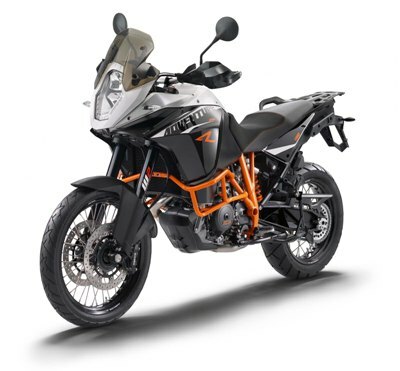 Remus Sport Exhaust HexaCone Slip On KTM 1190 Adventure. Moose Racing has released the new version Monarch Pass adventure gear – jacket, pants and two versions of gloves. This has been in development for the last two years and they really did a nice job of putting together an all inclusive adventure suit with out getting crazy expensive (like many others in this market segment). Click here to get the product details and get yours on order in the shopping cart before everyone figures out what a good deal this is and they are sold out! The Roto Pax RX-1G one gallon fuel packs are back in stock at DualSportWarehouse.com. Roto Pax has been back ordered on them for about 3 weeks and now they have caught up so if you’ve been waiting for one now is the time to place your order! Reluctantly selling my personal bike, the Dual Sport Warehouse test bed bike! This bike has only been used since 2012 so it is in very good condition and has under 7,500 miles on it. 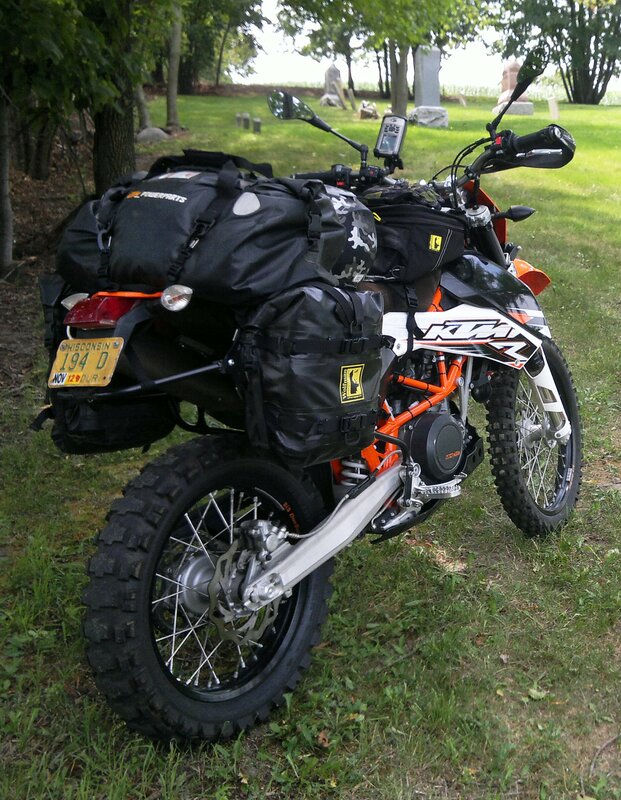 Loaded with accessories: Wolfman luggage racks and tail rack, Rotopax fuel pack mount, Wolfman Explorer Lite tank bag, Expedition Dry Saddle bags, Oberon clutch slave cylinder, Hammerhead shifter, Rox 2″ pivoting bar risers, fold-away mirrors, Cycra Pro-Bend hand guards, FMF Q4 spark arrestor silencer, K&N washable air filter, Rigid LED 1,900 lumen 6″ light bar, Koso heated grips, Heated gear power plug, Adjustable side stand w/large foot, CJD Billet fuel neck w/filter, CJD Foot peg extensions, GIT aluminum skid plate w/rear master cyl. coverage, Rally Raid rear brake lever, Renazco suede seat and new Dunlop 606 rear tire and Pirelli Rally front tire. Plus all the things that make the 690 a cool bike in stock setup like a slipper clutch, fuel injection, lightweight (just over 300 lbs. ), and 63 hp out of the box. The 690 motor is a huge improvement from the 640 in terms of ride-ability, power and torque. Much smoother thanks to a balance shaft, more rigid frame for better handling, and I average about 52 mpg in normal riding. This is a great all-around bike, if you can only own one bike and need it to cover a lot of types of riding, this is the way to go. I have put 17″ wheels on for street riding and on a previous 690 I set it up for ice riding in the winter. It is light enough and small enough to handle single track and has enough power to rip down gravel roads or wide open desert and hang with the big dogs. 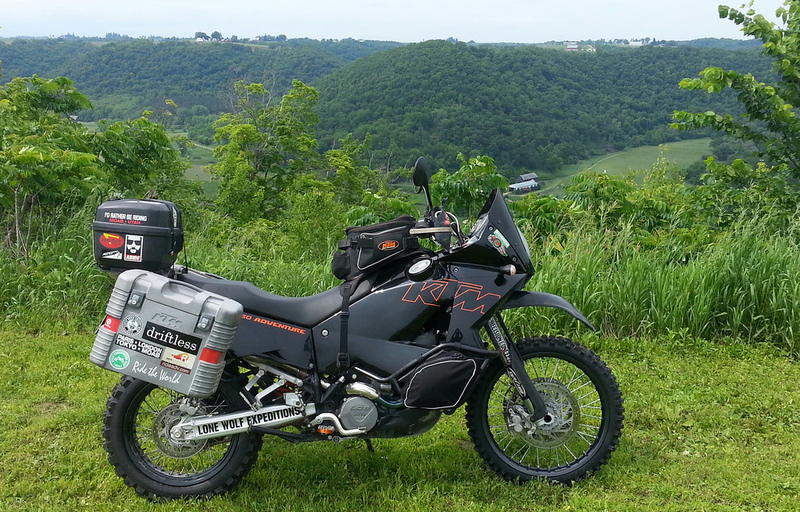 Charlie Lang has an “extra” 2011 990 Adventure laying around collecting dust now that he bought his new 990 SMT! The bike was bought new just a few months ago and has less than 200 miles on it. I don’t have pricing yet but if you’re interested please email me at info@dualsportwarehouse.com or call (262) 723-5518 and I can put you in touch with Charlie. Parts Unlimited puts out a monthly specials flyer called the “Low Down” that features new products, special deals and seasonal features. It covers all segments of the motorsports world from watercraft to motocross so you are sure to find something you need if you take the time to check it out. Click on the picture of the flyer and it will take you directly to the current months specials. If you see anything you’re interested in just note the part number and call Petrie Motorsports at (262) 723-5518 or email us at wpetrie@petriemotorsports.com to place an order. Or you are always welcome to stop in at our store at 950 County Rd. H, Elkhorn, WI.